I am obsessed with these sandals! These Mari sandals from J Crew have been haunting me. They are just so cute! They are the shade of Pepto Bismol, but I just can't keep them out of my head. I have spent the last two days trying to find them online with no luck and I have been seeing them all over my Instagram feed. Actually, I blame this obsession on Instagram. If I didn't keep seeing it on my feed they would have never been on my radar. Look at all these cute looks! Endless possibilities and so much fun! I had to have them. I usually don't spend $228 on a pair of shoes so first, I tried searching for similar alternatives. Sadly, I didn't find anything in comparison. 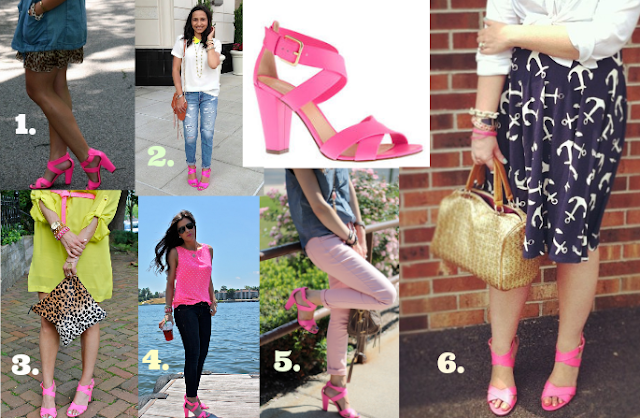 I really like this shade of pink because it stands out so much and I love the low heel. On my way home from work today I thought I would try to call a couple of stores in Atlanta, the closest stores to me. I was expecting disappointment. But it took only two phone calls to find them in my size! And even better news? They were on sale and I received an additional 25% off! These babies will soon be mine! I'm so excited! Ha, now on to my next obsession.... What's it going to be Instagram?